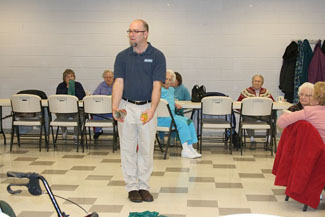 Twenty East Rockingham Senior Center members and five volunteers and guests were in attendance on February 20 to hear about “Bones/Bone Healing,” as discussed by Walter Vargo, Physical Therapy Assistant with Advantage Physical Therapy located in Elkton. This was the second appearance for a representative from Advantage Physical Therapy, and the company has agreed to offer its professional staff to discuss health related topics every ‘even’ month during 2013! (The Elkton location opened in July 2012). Mr. Vargo shared information on ways to maintain healthy bones–through diet and exercise–which will be significant in preventing falls and fractures in the aging population. To improve balance, he stressed that 30-45 minutes of exercise is needed three times a week. Mr. Vargo was gracious enough to demonstrate how common household items (canned foods) can be used as ‘weights’ while at home. He also showed us various stretching exercises with the use of bands, which was very intriguing for attendees. ERSC appreciates the willingness of Advantage Physical Therapy Center Manager Jeremy Whitmore, DPT, to allow his professional staff to visit our Center regularly and to keep us moving in a forward direction!